Directed by George Cukor; produced by Victor Saville. This is a lesser known Tracy/Hepburn film, and though it has excellent performances, and not just by the stars, I did not consider it one of their successes. 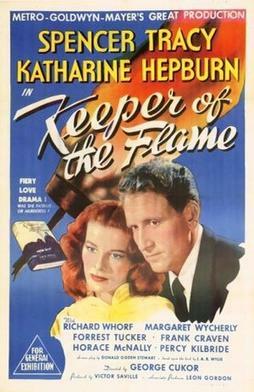 The plot involves Spencer Tracy, newly returned from reporting on the Second World War in Europe, confronted with the news that Robert Forrest has died in a car wreck. Forrest was an American hero of almost divine dimensions, beloved by everyone, including Tracy, who decides to write a book about the man. 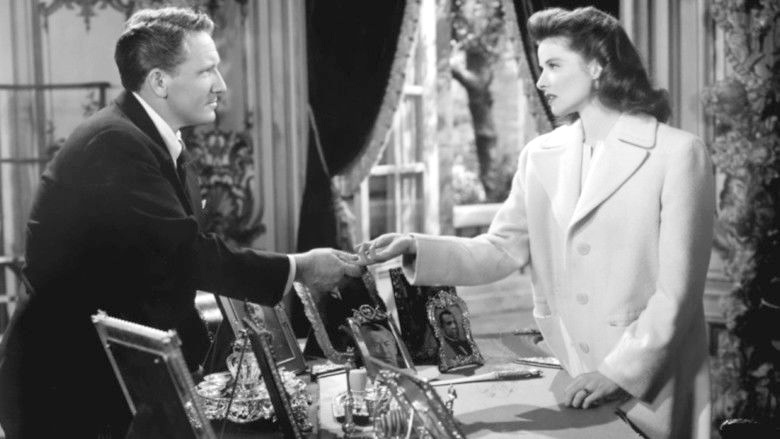 To do this, he finagles his way into the fortress-like mansion in which Forrest’s young widow (Katherine Hepburn) now lives. As he speaks to her, and to others, Tracy begins to suspect that there was something amiss with the legendary Forrest, or at least with his demise. Though writer David Ogden Stewart was proud of his script, I think it may have been from an ideological aspect, rather than literary. I found it rather obvious. From the start, the viewer is aware that something is going to be wrong with the fallen hero; too many people worship him blindly for him not to be flawed. Tracy is diverted, stone-walled and delayed so often that there is little doubt that a terrible secret will emerge. Yet Tracy, the veteran journalist, intelligent and dogged, pushes unseeingly toward a conclusion which, though it should have been shocking, turns out to be anti-climactic. One of the problems is that, while the film wants to portray the dangers to democracy that lurk at its heart, it also tries to be a murder mystery. The mystery, however, is, firstly, not much of a mystery, and, secondly, is almost an annoying distraction from what should have been the main plot-line. By the time Tracy discovers the truth - discovers by simply being told, rather than by any investigative unveiling - the viewer has already arrived at the solution, and is impatient for the plodding reporter to catch up. The two strands - the secret behind Forrest’s death and the secret behind the man - should have been complementary, but, instead, get in each other’s way. There is much greater success in the atmosphere of the movie. The air of hidden menace, of something kept clandestine, is ably depicted by the immense walls surrounding Forrest’s estate, and his half-mad mother, well-played by Margaret Wycherly, by turns sympathetic and frightening. There is also foreshadowing in the subtly-written minor characters, the local doctor (Frank Craven) and the village taxi-driver (Percy Kilbride); the former, almost open in his distrust of Forrest, the latter expressing suspicion by stating that he didn’t follow Forrest because ‘some people just ain’t “joiners”.’ And Richard Whorf is a stand-out as Forrest’s secretary, a man whose public subservience and timidity contrasts sharply with his private personality. But Keeper of The Flame, despite what must have been its timeliness in 1943, cannot rise above a script that called for smarter main characters, and didn’t provide them. I've never heard of this movie--from what you say, I suppose there's a reason for that. It sounds like an example of an intriguing plot premise that, in practice, just didn't "work." I see a number of movie plots I think I can improve upon - after the fact, of course. But sometimes, a better direction for the story or a better ending leaps out at one. That's very kind of you. In this case, I think the writer, Stewart, may have been trying to remain true to his beliefs while making them popular. His efforts at a premise may have overwhelmed his efforts at a story-line. I have a technical question: how are you acquiring your stills of the movies reviewed? I had a movie review blog of my own and had some issues early on, as I was literally taking photos of my television.